Is Trump auditioning for a future Trump TV Network? Donald Trump has denied any interest in launching a television network. But that's not stopping his campaign from experimenting with something that looks like a prototype. On Wednesday night the campaign worked with a conservative live-streaming site called Right Side Broadcasting to produce pre-game and post-game shows for the debate. The stream reached millions of Trump's fans through his Facebook page, and was the most popular debate-related Facebook Live programming of the night. While the viewership was still small compared to traditional television coverage of the debate, it generated tons of press, with some stories asking "did Trump TV launch last night?" 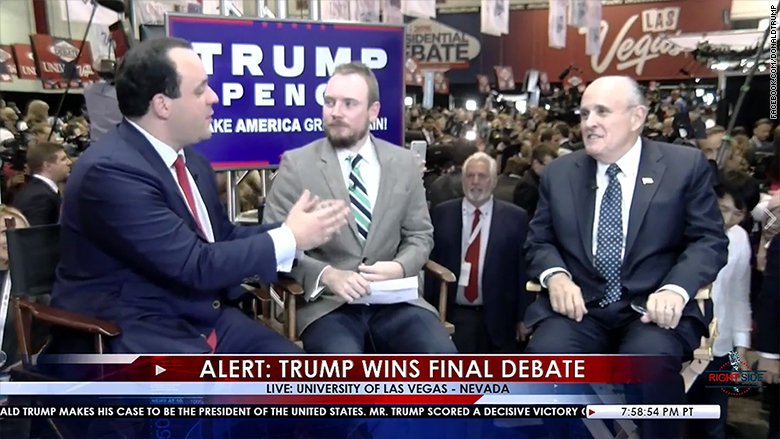 The stream looked like a no-frills version of a cable news channel -- albeit a version that was pro-Trump through and through. Media experts and politicos have been abuzz about the prospect of "Trump TV" -- a post-election network aimed at Trump fans -- for months. Every time Trump plays to his base at the expense of appealing to swing voters, observers wonder if he's really just stoking the passions of his future paying audience. Related: Trump TV may be in the works; but can it turn voters into viewers? After Wednesday's debate, Daily Beast editor in chief John Avlon said on CNN, "He basically teased the opening season of Trump TV." Clinton campaign aides have also invoked the possibility. In the spin room after the debate, Clinton press secretary Brian Fallon was asked about Trump's appealing-to-the-base strategy, and he said, "Maybe it's a strategy for creating a nice base of customers to monetize a television network." Some Trump allies reject this, saying it is tantamount to a conspiracy theory. But "Trump TV" talk has been backed up by reporting by Vanity Fair, The New York Times and other outlets. Trump confidants have had several informal conversations about the possibilities. Earlier this week the Financial Times reported on a conversation between Trump's son-in-law Jared Kushner and investment banker Aryeh Bourkoff. Sources confirmed to CNNMoney that the chat happened, but said there hasn't been any follow-up. "Trump TV," if it happens, could take many different forms. One form could look like the live stream on Trump's Facebook page on Wednesday night, with commentators talking about campaign news and attacking Hillary Clinton. The stream topped out at around 200,000 simultaneous viewers on Facebook before the debate -- low when compared to TV, but high when compared to everything else on the web. The pitch was clear: the campaign said it was taking its message "straight to the American people," bypassing "the corrupt mainstream media." 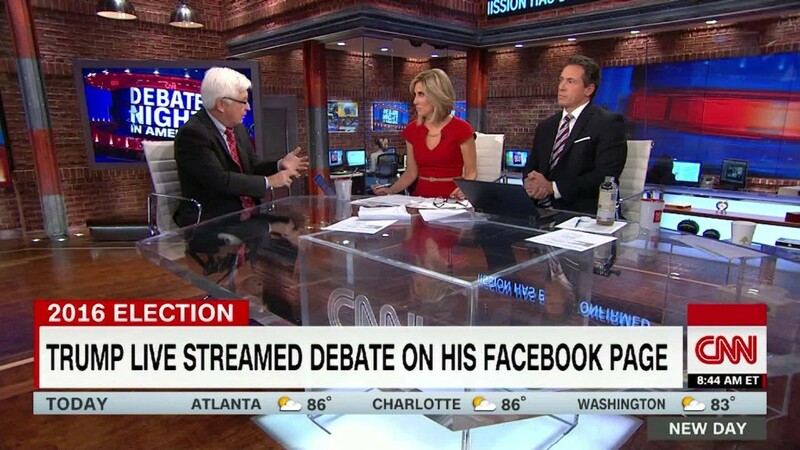 Once it was archived and made available for later viewing, the stream reached more than 8.6 million Facebook users, according to CrowdTangle data, beating the debate streams from news outlets like ABC and Fox. Steve Bannon, the Breitbart News chairman who became the Trump campaign CEO in August, did not deny that there's been talk about a possible network when asked by CNNMoney earlier this week. He responded to the rumors with a smile and said, "Trump is an entrepreneur." He also pointed out Trump's social media prowess on Facebook and Twitter, saying, "Look at the engagement. It's incredible." Related: Steve Bannon speaks: Donald Trump is "master of the head fake"
A Trump media operation could alternatively seek cable system carriage or take more of a Netflix-like subscription approach. Another form of "Trump TV" could happen even without Trump's direct involvement. Bannon has been interested in expanding Breitbart's video footprint for years. A Breitbart network could appeal to many of Trump's biggest fans. But any of these scenarios would face serious difficulties, from marketing to programming to subscriber retention. However, Trump has several things working in his favor, including undeniable television talent, loyal supporters, databases full of voter contact information, and of course his famous Twitter feed. And the millions of voters now supporting him amount to a built-in customer base.